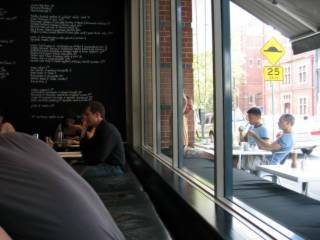 We arrived in Sydney at about 10:30 on Friday morning, dumped the bags at the hotel, and An & I headed straight to Bill Granger’s café, bills 2 in Surry Hills. Coincidentally, it was only a short walk from the hotel. 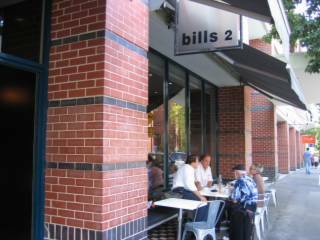 And guess what restaurant is just two doors down from bills 2?? Kylie Kwong’s restaurant, Billy Kwong!! Look, it's Kylie Kwong at billy kwong! Whilst I was forcing An to take that photo of me, an employee walked into the restaurant, and looked at us like we were weird. Anyway, on to bills 2. 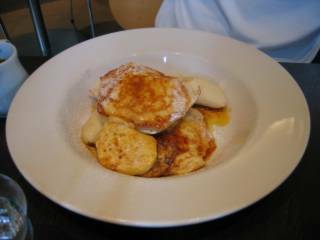 I have recently become a Bill Granger fan on the recommendation of some fellow forum members at Nigella.com. I’ve bought one of his books, bills food, and seen his program on Lifestyle. They’re both great. 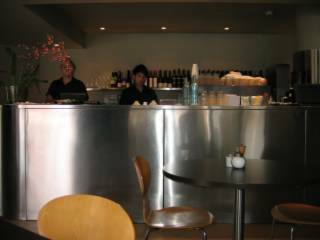 The café itself is a relatively small area, with large windows, a stainless steel bar, wooden seats, round and square tables and a padded bank of seats along the windows. 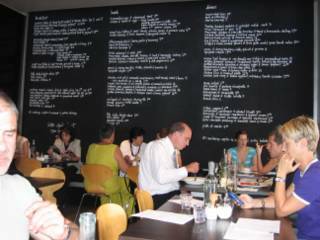 One wall is entirely filled with a huge blackboard upon which the menu is written. I wasn’t in the mood for anything sweet, so I chose a Softshell Crab Sandwich with Cucumber, Watercress and Remoulade, on wholemeal baguette with dressed baby cos lettuce on the side. 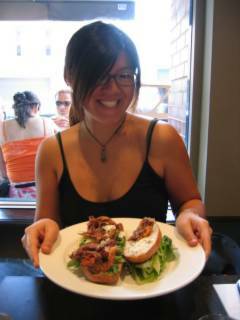 The bread was chewy, the crab was crunchy, quite salty, juicy and oily. 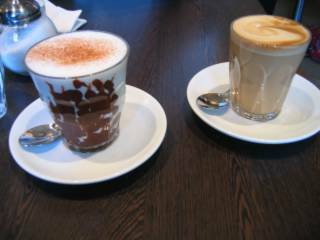 Highly delicious and substantial! And totally worth the $19.50 that it cost. Here's the menu! I took it at super-high quality so that you can download it and zoom in and read it in all its glory!